Meg and I be travelling to Destin, FL for a week in May as a rendezvous point for my 3 siblings and spouses and us to get together in some shoreline condos. I've never been there before and am unfamiliar with the area so I'd like to get to know the surroundings. Pensacola looks like it might have some interesting Naval POIs like the National Naval Aviation Museum. How about POIs near Destin...any recommendations? My brothers and I like to fish, so any charter recommendations would also be appreciated. Favored restaurants? Cuban food would be great to sample for us since none of us can get it near our homes. Thanks for any suggestions and tips you might have for our trip. Looking forward to sampling some of your Florida sunshine and water! The Naval Museum in Pensacola is excellent, but it's not as close or as easy to, reach as it looks on a map because of traffic.The drive along the Gulf is beautiful. Fish, play golf, chill in the sand complaining about yankees and the guvmint is what it's all about. Flywright, we live across the bay from Destin and go over there frequently. As Blake said you really need to take in the beaches. The sand is as white as snow. Water should be warm then. Go to the boardwalk on the north side of Destin harbor and walk the length of it. All the charter boats operate out of there and plenty of places to book them. The Air Force Armament Museum is over close to the airport by Ft Walton and Niceville. Worth a stop there, and of course the National Navel Museum in Pensacola is fantastic. As far as restaurants we don't have a favorite. Most of them are good. No Cuban that we are aware of. If you like Cajun, the best Cajun food I have ever had is at Ernie's Dock Side Restaurant in Niceville. If we are in town then we could meet you there. This area is a great place and has lots of beauty. Not a lot of cultural things here just good old beach and fun. The Blue Angels practices - usually Tue & Wed AM are open to the public and worth the trip. Most days the pilots will meet & greet in the museum after the show. Schedule for practices & shows are online. It is an experience being that close to the flight line & show. Al, forget the Cuban. It ain't happening down there. Etouffee is the operative word. Blackened red fish if you can find it. Grouper parmesan if you can find it. That area is all about the beaches. They really are some of the nicest. It also has some of the prettiest water this side of the Bahamas. Check the color of the water when the tide is coming in East Pass. Oh yeah, the oysters from East Point near Apalachicola are really good. The Naval Air museum is really good, and worth the trip. Coming back through Pensacola stop at Joe Patti's Seafood Market. Pick up some fresh seafood. Destin has some of the best fishing on the Gulf Coast. As PHK said, there are plenty of charter boats on the harbor. You will be there at a good time of year. Just talk a little slower so that you will be understood. Remember that LA down here is really Lower Alabama. -There is actually a Destin History and Fishing Museum. We enjoyed it, a chance to learn more about the town's history. Antique fishing equipment and boat. -Historic Pensacola Village. They offer a two hour guided tour, but some people spend an entire day there. It is truly worth the time. -Pensacola Lighthouse. We can't miss a lighthouse anywhere. -Uncle Sandy's Macaw Bird Park. Yes there are birds and bird rescues everywhere but something about this park is endearing. And you get to feed the birds. I think it's just a nice place to visit. This is really great stuff, guys! I really appreciate it. Keep 'em coming if you think of other stuff. We plan to keep busy and take in as much of the area as we can. I also second Joe Patti's Seafood, it is a must stop for my family. We make the trip if we are within an hour’s drive also near buy is The Oar House on Bayou Chico, overlooking Bahia Mar Marina. Good place for lunch and boat watching. Very casual (read outdoors)It has great food and service. In Destin, Dewey Destin's at Crab Island where you dine on the dock overlooking crab island Destin’s moats popular place for boaters to gather. Doesn't Fighter Pilot have a Californian 34 in that neck of the woods? If you make it in to our neck of the woods let me know. Thanks for all the advice guys! We'll definitely be doing some fishing and golf. Naval Aviation museum is high on the list, too. My brothers and I all like to eat, so we really appreciate the restaurant and market recommendations! Sorry we won't be making it to the east coast of FL, Oliver. There are enough of you TFers there that I should make it a separate trip someday! It would be great to finally meet so many of you guys who have been conversing here for years, especially you, Don and Parks! I'd love to charter a trawler to make the rounds!! Watch out for Parks, I heard the man has a shark mobile! He might even try to sell you stuff out of the back..
From a fishing standpoint you should try inshore that time of year. Red fishing will be good, cobia will still be around and tarpon will be getting started. The offshore stuff (grouper snapper etc) is good too but not much different than you get at home....same techniques different fish. Best guide service in that area is shallow water expeditions. Head guide is David magnum. He is one of the 5 best tarpon guides in the us. Less $ than a big boat as well. ...my brothers and I will require a MUCH larger boat that those!!! My youngest bro really cuts the avg weight for the 4 of us down to something like 210-220 lbs. I was picturing something more.....errrr....trawler-like! I'd even settle for a sportfisher! I prefer a semi-planing to planing hull, metal or fiberglass (no wood), pilothouse-equipped, galley-optional. Any anchor recommendations? Joe Patti's seafood also has a nice liquor store next door that has good wine selection , even for those California folks . Have fun it sounds like a good time . 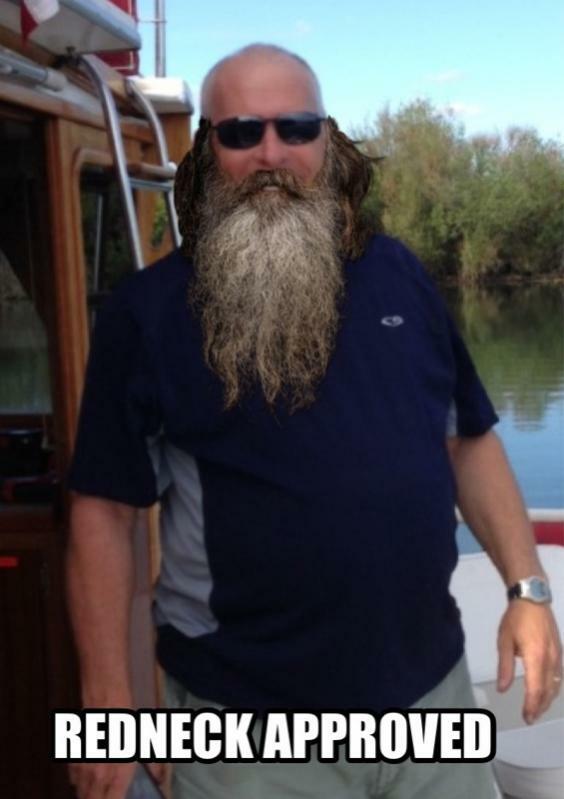 Al I think you got enough redneck in you to just fit in . You may not want to go home . Seaside is worth a trip if you're in the Destin area. Or take a whole day and make the drive to Seaside for lunch and then continue on to Rosemary Beach for dinner. Bud and Alleys in Seaside (Rooftop Bar, Roof Deck, Lounge, Specialty Drinks, Margarita's, Martini's, Wine, Cocktails, Cold Beer, Beverages, Best Gulf Views ) is great for lunch and has awesome views of the Gulf and the whitest beach you'll find anywhere. Or for something even more casual, there is a row of vintage Airstream trailer "food trucks" along the main drag across the street from the beach that serve a variety of good food, such as BBQ, gourmet grilled cheese sammiches, ice cream, hot dogs, etc. Rosemary Beach and Alys Beach (next door to each other) is best for dinner, with several great restaurants. If you want to burn some calories, there is a nice bike path between Seaside and Rosemary Beach -- about 9 miles long. That guy is from San Francisco. Metro male. Real redneck would have camo hat on !